15/06/2009�� Fix a Laptop's Sticky, Broken Keys As we learned last week, it's fairly easy to fix a noisy overheated laptop: Open an underside panel, (carefully) blow out the dust, then enjoy the praise... Sticky Keys is part of Windows Ease of Access features that allows a user to tap the Shift, Ctrl, Alt or Windows key once to achieve the same effect as holding the key down. 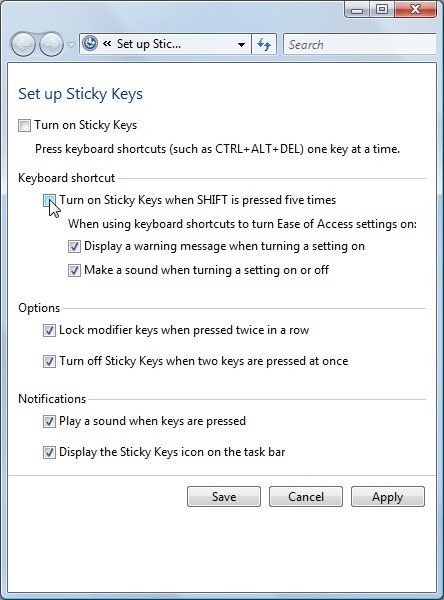 If you press the SHIFT key 5 times in a row at Windows login screen, the Sticky Keys application ( sethc.exe ) will launch and ask if you want to enable sticky keys feature. For a computer novice, resetting windows password with Sticky keys must be a lit troublesome if you�re unfamiliar with command prompt. But don�t worry, this article give you a full steps to teach you how to use Sticky key to remove password. how to get pine sap off sidewalk My HP Envy laptop ended up with slow key response after a W8.1 upgrade. Two calls to Costo Concierge and five to HP Tach Support resulting in two days of lost time and a complete reset to factory default settings they agreed that they couldn't figure out the problem and have just sent me a return box. HP Chromebook 14 . With the HP Chromebook running lightning-fast Chrome OS, the best of Google is at hand on a colorfully sleek and stylish notebook. how to fix disk 1 unknown not initialized HP Chromebook 14 . With the HP Chromebook running lightning-fast Chrome OS, the best of Google is at hand on a colorfully sleek and stylish notebook. 29/09/2007�� The problem with notebook keyboards is that they are VERY easy to break. You might be able to use an alcohol wipe (quick drying), perhaps with some tweezers to help you swab it under keys without popping the keys off. My HP Envy laptop ended up with slow key response after a W8.1 upgrade. Two calls to Costo Concierge and five to HP Tach Support resulting in two days of lost time and a complete reset to factory default settings they agreed that they couldn't figure out the problem and have just sent me a return box. There are other reasons as well--sometimes sticky fluids will get under a key and interfere with its action or cause electrical problems. As this is a fairly common problem, it's fairly easy to fix. As this is a fairly common problem, it's fairly easy to fix. I just bought my eleven year old daughter an HP laptop with Windows 7. I set her up as the administrator, with a password (which in hindsight, I shouldn�t have) she changed the admin password, but didn�t write the new password down, and can�t remember what she changed it to.